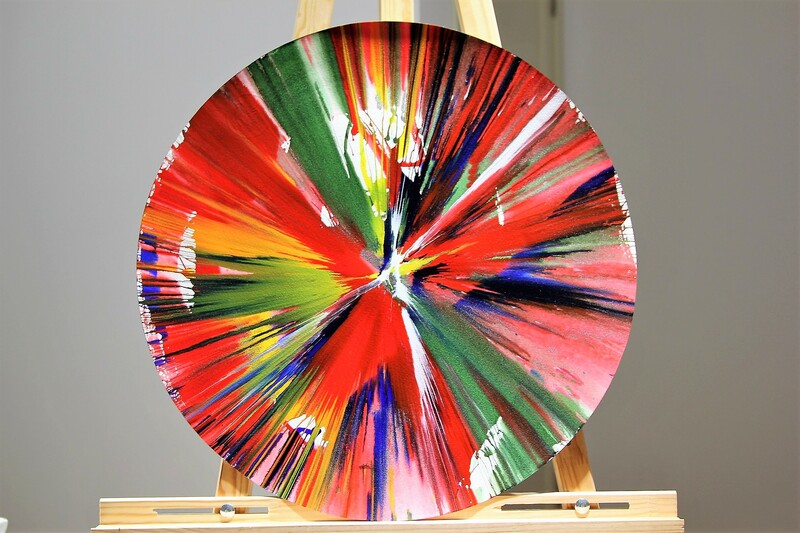 Part of the Modern & Contemporary Art Auction (Damien Hirst) Created at Damien Hirst Spin Workshop at the opening Damien Hirst “Requiem” exhibition at the Pinchuk Art Centre on April 2009 52 x 52 cm (79 х 59 cm). Acrylic and metallic paint on paper. Blind stamped and stamped with ink visitor signature on verso; ‘This painting was made by/to celebrate the opening/of Damien Hirst, Requiem,/at the Pinchuk Art Centre/on April 25-26th 2009. 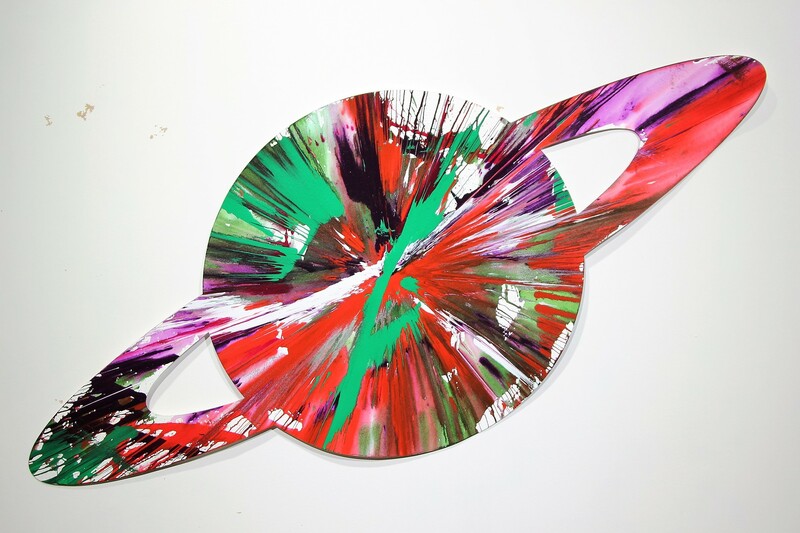 The artwork unframed, colorful, in good condition, has multiple holes where was attached to spin mashine. (not signed by Mr. Hirst) Private collection, Kiev. 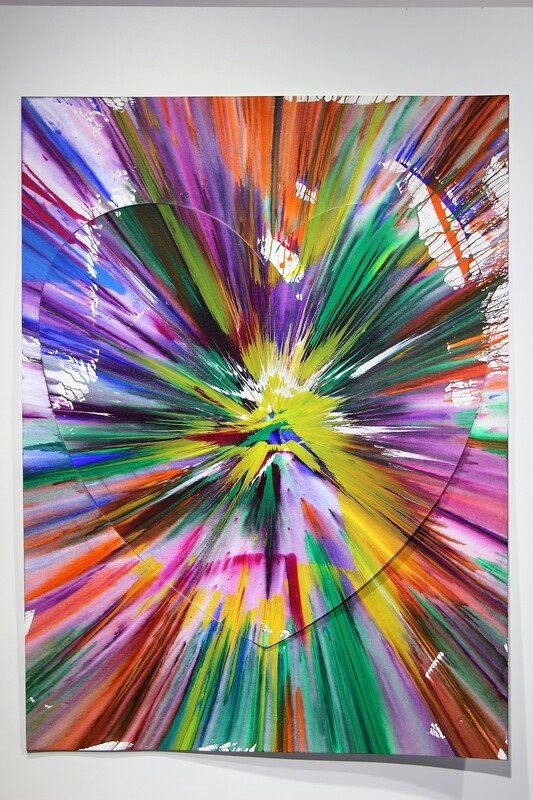 Part of the Modern & Contemporary Art Auction (Damien Hirst) Created at Damien Hirst Spin Workshop at the opening Damien Hirst “Requiem” exhibition at the Pinchuk Art Centre on April 2009 52 x 69 cm (20.472 x 27.165 in). Acrylic and metallic paint on paper. Blind stamped and stamped with ink artist’s signature on verso; ‘This painting was made by/to celebrate the opening/of Damien Hirst, Requiem,/at the Pinchuk Art Centre/on April 25-26th 2009. 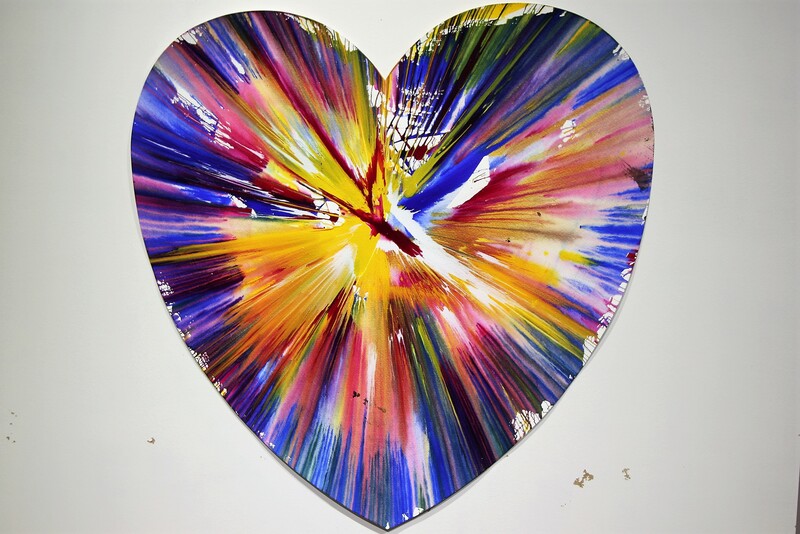 The artwork unframed, colorful, in good condition, has multiple holes where was attached to spin mashine. Private collection, Kiev. The vibrant colors make this artwork absolutely striking. Created with public collaboration at the Damien Hirst Spin Workshop to celebrate the opening of Requiem 2009 at the Pinchuk Art Center, Ukraine Bears Hirst blindstamp and stamped with signature and inscription: “This painting was made by / to celebrate the opening / of Damien Hirst, Requiem, / 25/04/2009 at the PinchukArtCentre / on / Damien Hirst [stamped signature] / (c) Damien Hirst” on verso; 52 cm diameter. Acrylic and metallic paint on paper. Unframed, colorful, in exсellent condition. Private collection Kiev. 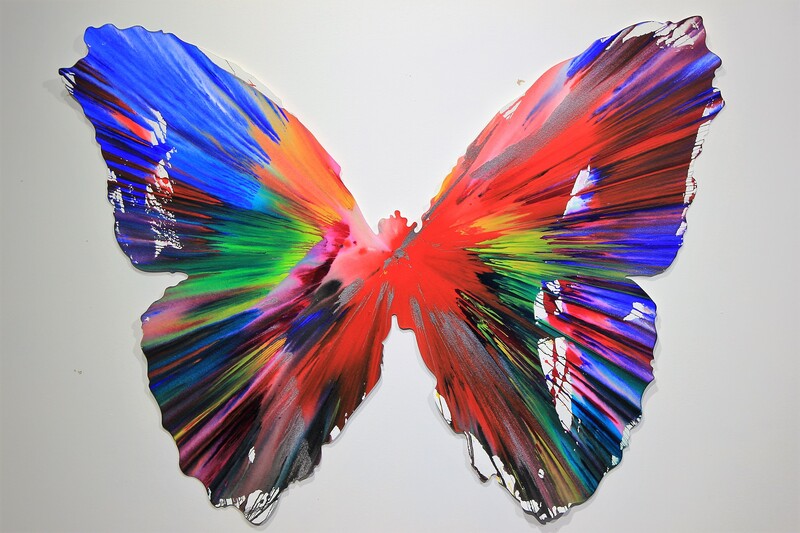 Part of the Modern & Contemporary Art Auction (Damien Hirst) Created at Damien Hirst Spin Workshop at the opening Damien Hirst “Requiem” exhibition at the Pinchuk Art Centre on April 2009 87 x 37.5 cm. Acrylic and metallic paint on paper. Blind stamped and stamped with ink artist’s signature on verso; ‘This painting was made by/to celebrate the opening/of Damien Hirst, Requiem,/at the Pinchuk Art Centre/on April 25-26th 2009. The artwork unframed, colorful, in good condition, has multiple holes where was attached to spin mashine. Private collection, Kiev. 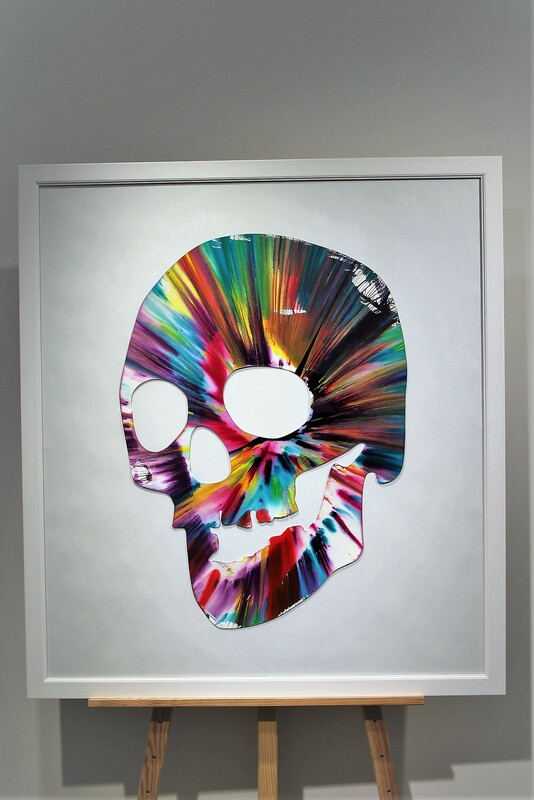 Skull Spin Painting Skull Spin Painting Created at Damien Hirst Spin Workshop at the opening Damien Hirst “Requiem” exhibition at the Pinchuk Art Centre on April 25-26th 2009. "Hirst" blindstamped and stamped with artist’s signature on verso; "This painting was made by/to celebrate the opening/of Damien Hirst, Requiem,/at the Pinchuk Art Centre/on April 25-26th 2009." Acrylic and metallic paint on paper. Image dimensions: 52x71cm. Framed in wooden frame size 85x95cm.